Incredibles 2 is the long-anticipated sequel to Pixar’s 2004 superhero smash The Incredibles and comes to us from the original’s creator Brad Bird. 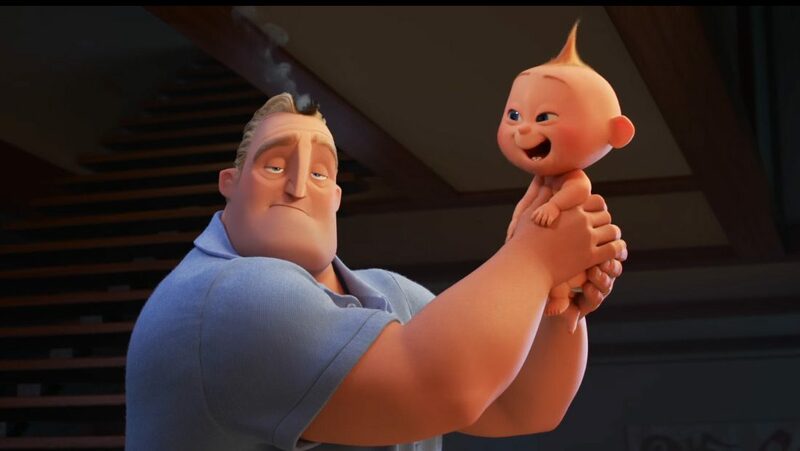 Set not long after the events of the first film, Incredibles 2 once again follows the super-powered Parr family as they try to overcome the prohibition of superheroes with the help of a nostalgic billionaire named Winston Deavor, when a mysterious new villain known as the Screenslaver comes into the picture and threatens their safety. Although this plot summary may sound short, there’s much more under the surface than one would imagine, and while this review will leave out any major spoilers, I still recommend going into this movie like I did and reading this review afterward. All that out of the way, the original Incredibles is probably one of my all-time favorite animated films, and sequels to fan-favorite blockbusters released ten or so years later such as 2016’s Finding Dory aren’t always home-runs in my book; therefore, I wanted go into the sequel with tempered expectations and that definitely helped because Incredibles 2 is not as incredible (pun intended) as its predecessor, but is still an animated sequel that I would absolutely recommend. On a technical level, this film is yet another example of how Pixar is one of best major animation studios in Hollywood. I guarantee that the vibrant CG visuals will stand the test of time. Many of the textures look amazingly photorealistic yet somehow contain a much-needed animated quality, so much so that I want to commend all of the animators involved for not trying to overstep their boundaries while still putting an insane amount of time and effort into making this movie as gorgeous as possible. The film’s art direction, similar to its predecessor, is also dazzling, especially for a multi-million-dollar animated feature released in this decade. Brad Bird took plenty of inspiration from 1940s serials and silver age comic books when he made the original film and further incorporates those influences into the sequel. There are so many inventive location and gadget designs on-display here that it gives the world a sense of identity, which is important considering how shared movie universes such as the Marvel Cinematic Universe (MCU) are all of the buzz right now. Even the action scenes are worthwhile since they have a clear sense of direction without sacrificing what makes them so engaging in the first place. As for the music, Michael Giacchino composes yet another jazz-infused orchestral score that, while not quite as memorable as the first, still features some exciting new compositions and finds ways to reincorporate familiar motifs from the original; in fact, I wouldn’t be surprised if this score grows on me the more I listen to it. One of the many reasons that the first Incredibles still holds up is because of how captivating and believable the main characters were, and the sequel is no exception. Watching this family interact with either each other or other characters is fascinating to say the least because they are normal people who have to deal with having superheroes, which adds another layer of depth to them. In fact, Bob and Helen’s heartfelt husband-wife relationship from the first film once again shines, and not in the way I expected it to. For anyone who saw the trailers, Bob and Helen basically fill the opposite roles from the first Incredibles and most surprisingly, this not-so-subtle role reversal is not as derivative as it could have been. Out of those two characters, Helen has a more major role and it works for context of this film, which is all I’ll say without going into spoilers. Bob’s arc on the other hand surprised me the most since I did not think it would have been this clever and emotional. Fans of Dash and Frozone will probably be disappointed that neither receive much development this time around, which I didn’t mind because they are the types of characters that don’t need much development to remain interesting, plus their powers are still put to great use in several situations. Conversely, Violet has the most development out of the three Parr children and her arc is one that I can see many teenage girls sympathizing with. Of course, I can’t forget to mention the youngest member of the Parr family, Jack-Jack. Since this film is a direct sequel, Jack-Jack has not grown much older so many fans are wondering if he will actually play a pivotal role or if he is simply there to look cute. Thankfully, Jack is more of the former in this case but is still charming enough to serve as the film’s main source of comic relief—he is only a baby after all. As well-written as this family is, the returning voice talent which includes Holly Hunter, Craig T. Nelson, and Samuel L. Jackson among others should all receive the credit they deserve because even after fourteen years, these actors give their respective characters a sense of identity and elevate them from simply being voices. I haven’t even mentioned the new characters and for the sake of spoilers, I’ll only discuss the two most important ones: Winston and Evelyn Deavor. Voiced by Bob Odenkirk and Catherine Keener respectively, these two characters serve as aides for Elastagirl and share a different sibling relationship that fits into the film’s larger themes. Speaking of “larger themes,” the screenplay for Incredibles 2 isn’t as innovative as that of the original, but nevertheless works well enough on its own and even better as a sequel. 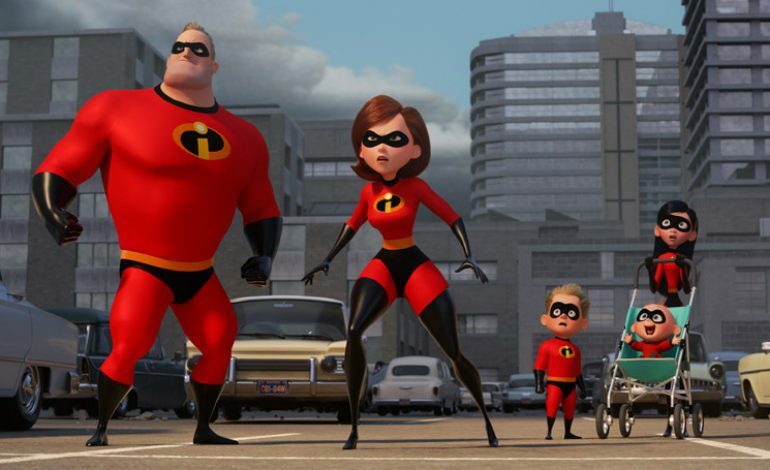 One of the main elements of the first Incredibles that sets it apart from other superhero movies is how it creates a captivating, yet realistic world that can still put the characters in the forefront; Incredibles 2 is no different as it introduces new supers from afar and therefore makes the world feel bigger than it already is. The film also explores some surprisingly mature themes and messages without ever making itself seem as if it is anything other than a fun Disney superhero movie. On a related note, one of my biggest worries going into Incredibles 2 was that it would simply rehash the plot of the original with some minor exceptions and thankfully that is not the case. Rather than recycling the iconic moments from the original film such as “No capes!” and “Where is my super suit?”, Incredibles 2 forges its own path and mostly uses references to the original to fill audiences in who haven’t seen it on what already happened. While the sequel does follows similar plot beats from the original, that doesn’t bother me all that much since most sequels already do that. Moreover, seeing the original beforehand is not essential but it is still recommended since that will lead to a greater emotional attachment to the sequel. My biggest issue with Incredibles 2 comes down to a specific reveal that I could see coming from a mile away and in turn makes the plot more predictable, but not to a point where it completely ruins the movie. Incredibles 2 is not the perfect sequel that fans have been clamoring for but that doesn’t mean it isn’t great for the most part. Outside of that piss-poor reveal, this film succeeds as an exciting and compelling animated film that both children and adults can enjoy. Even though I can say that Incredibles 2 is one of the better Pixar sequels, I’m still extremely skeptical about the studio making another Toy Story movie.